The Holyland1000 tour is a charity event designed for pre-1965 sports and race cars of distinction. 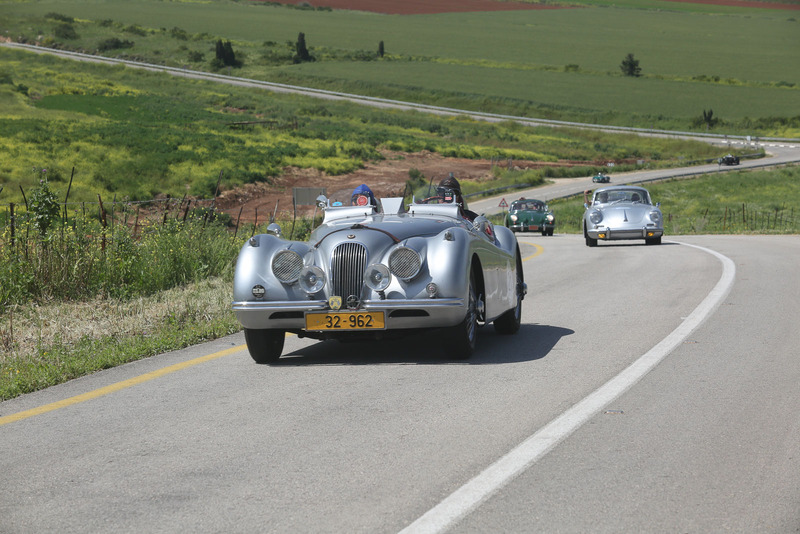 The Holy land 1000 tour was founded by a group of Israeli sports car enthusiasts, after participating in some of the world most renowned classic car rallies and tours. Realizing that the perfect mix of wonderful roads, history and natural beauty existed right under their noses, they set to establish an event which would take the participants through the best modern-day Israel has to offer. This luxury driving event is typically scheduled at the tail end of the Israeli winter season when even the Negev desert blooms. Teams cover over 1000 miles through the land of Israel during six days of – sometimes – intense vintage rallying, allowing them to experience the remarkably diverse culture, climate and topography of Israel. During March 2015, the inaugural edition of the Holyland1000 took place. It was deemed a great success, and in its footsteps followed the 2nd Holyland1000 event. 77 teams from Argentina, Ecuador, USA, Canada, UK, Switzerland, Germany, Kazakhstan, Denmark, Greece, Norway and Israel participated in the 2018 event. They brought joy and colour to the communities they visited, and in a truly generous fashion, made Scholarship donations to College students at Sapir college in the southern city of Sederot and a donation to the “Nerradim Village” in the Negev desert. The 2018 tour roads and hospitality were carefully chosen to bring the best Israel has to offer. Departing the Mediterranean coastal city of Tel Aviv, the 2018 tour drove through the beautiful terrain of the Negev desert, the snow caps of the Golan Heights, dropping to the lowest point of earth – the Dead Sea, visited the Red Sea town of Eilat, along the Sea of Galilee and visited the must-see city of Jerusalem. The route drove through mainly rural areas, where the driving and roads are top notch, and the hospitality world class. “When car enthusiasts want to go touring, they usually think about the Mille Miglia, the Colorado Grand or the Peking to Paris….The Holyland1000 is now firmly established among the ranks of those revered events. Martin Button, INSIDER, The Pebble Beach Magazine. For more on the 2018 tour, please visit the 2018 tab, for pictures, videos and media impressions of the event. Information on our next adventure will be available early 2019.